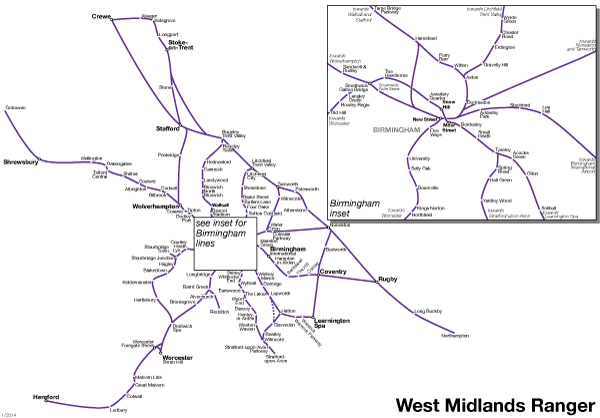 The West Midlands Day Ranger is good for one day unlimited travel in the West Midlands (Birmingham and Coventry) and parts of neighbouring counties including Crewe, Hereford, Northampton, Leamington Spa, Rugby, Shrewsbury, Stafford, Stoke-on-Trent, Stratford-upon-Avon and Worcester. It is ideal for making day trips from Birmingham. This rail pass is good for off-peak travel after 9am Monday–Friday (after 9.30am if you’re using a Two Together Railcard to obtain a discount fare) and all day on weekends and bank holidays. The West Midlands Day Ranger is valid for travel on the lines indicated on the map, but it is not valid for travel on Arriva Trains Wales services on the Marches Line (between Crewe and Hereford).